Entry filed under: Awards, Recognitions, Celebrations, Librarians, Library Garden. Tags: Peter. That is sooo great – big congrats! And I think it is always important to “toot” one’s own horn – we actually as a whole don’t do it enough and everyone who knows you knows you are a humble enough person that when you do it you really just want to share your good news and celebrate with all! And are not doing it for any “negative” purposes/reasons… I think we should take the opportunity, especially here as a group on LG, to do that. Sara, thank you also for your congrats, and right back at you! I’m going to be doing a post on Toastmasters (At toast post?) to talk about how we’ve set up a “corporate” chapter for S. Jersey librarians. 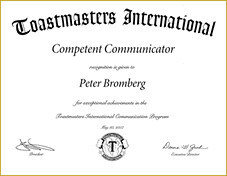 I am going to continue on with Toastmasters, not with any goals (i.e. DTM) other than to continue to improve as a public speaker. I need a librarians’ toast masters!